(May 25, 2010) — REStronics New England recently hosted an open house at their Billerica, MA showroom to demonstrate and discuss SPI and AOI. Inspection technology from ORPRO Vision was used to perform live PCB inspection demos. The ORPRO Vision systems available for visitor demos included the Symbion S36 Plus component and post-solder AOI; Symbion P36 Plus 2D/3D solder paste deposition inspection (SPI) system; and the Spectrum prototype table-top AOI system. Kenneth Lunde of ORPRO Vision presented “AOI for Defect Detection vs. AOI for Process Controls” during the open house. He discussed ways for electronics assembly to include post-paste and component inspections, and why this visual inspection benefits the bottom line. “Opinions regarding AOI are that it’s a tool to capture and report component defects incurred during the assembly process. AOI is an effective tool for this purpose when used at a post-soldering stage,” Lunde noted, saying that such implementations are intended as a “safety net to ensure that no defects are shipped out the back door.” Why use AOI before the soldering process? Lunde said that, without solder paste inspection (SPI), all the possible solder level defects proceed down the line unchecked. “If most issues are solder specific, then pre-solder inspection is not your best value placement for test. On the other hand, if most defects observed are component-level defects, then testing solder joints may not be the best option. It is a question of support time.” Lunde also compared the value of 2D SPI sampling to true 100% paste inspection, which functions as a process control. When SPI is implemented with AOI inline with SPI post-deposition and AOI pre-reflow, all data collected reflects process events, he added. Lunde reviewed the uses for AOI pre- and post-reflow, and what component- and solder-level defects can be captured. “There is a not a best solution for every line. It can be the application of AOI or SPI alone. It can be the implementation of both technologies,” he said. Assemblers should ask themselves: Where are the issues today? Where will they be in the days to come? and base their inspection strategy on their answers. For more information, visit http://www.orprovision.com/ or http://www.restronics.com/. Read more about inspection on http://www.smtonline.com/ in our Inspection center. (May 11, 2010) — A few companies announced equipment sales and new customers from the show floor at IPC APEX EXPO, held in April 2010 in Las Vegas. (Check out our Twitter archive for a few of the sales announcements from ASYS Group Americas and others, http://twitter.com/SurfaceMount). Following the show, however, many more are announcing completed sales initiated at the exhibition. Here are a few of the partnerships; add your own in the comments section. 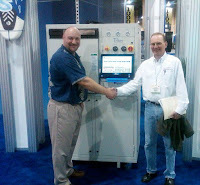 Did you make a purchase, or a sale, at the IPC APEX EXPO 2010 in Las Vegas? Tell us about it in the Comments Section below.